Best-selling British novelist Terry Pratchett has died at the age of 66 after a battle with Alzheimer's disease. After his death Thursday, the #TerryPratchett hashtag took Twitter by storm – with fans racing to remember his best quotes. "Most of the great triumphs and tragedies of history are caused not by people being fundamentally good or fundamentally evil, but by people being fundamentally people." "It is well known that a vital ingredient of success is not knowing that what you're attempting can't be done." "Some humans would do anything to see if it was possible to do it. If you put a large switch in some cave somewhere, with a sign on it saying 'End-of-the-World Switch. PLEASE DO NOT TOUCH', the paint wouldn't even have time to dry." 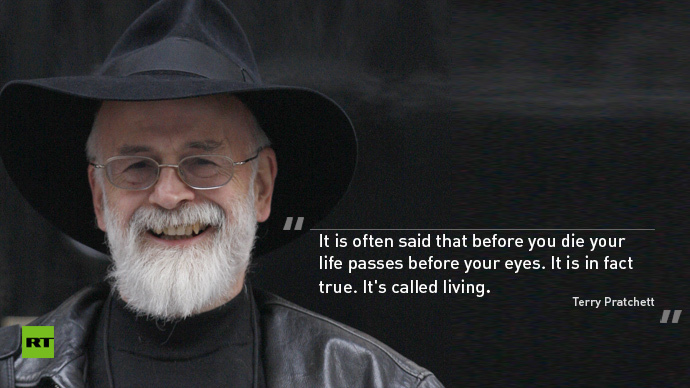 What are your favorite Terry Pratchett quotes? Please feel free to share them in the comments section below.